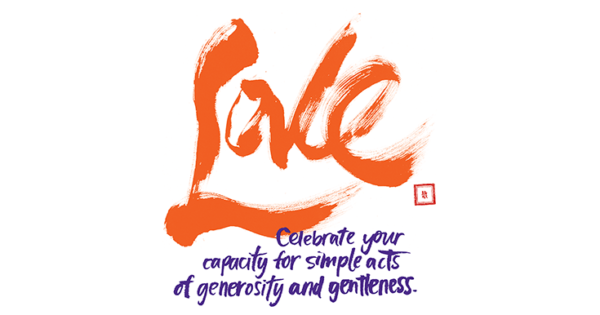 Instead of trying to promote or defend ourselves, says Chögyam Trungpa Rinpoche, we can base our lives on something more powerful and trustworthy—our basic goodness. Paintings by Chögyam Trungpa Rinpoche. Lettering by Hannah Reynolds. Meditation practice is not an exotic or out-of-reach approach. 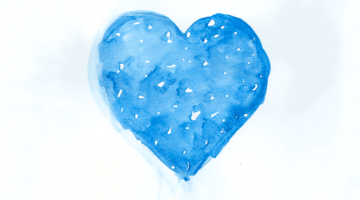 It is immediate and personal, and it involves an intimate relationship with ourselves. It is getting to know ourselves by examining our actual psychological process without being ashamed of it. We are often critical of ourselves to the point where we may become our own enemies. Meditation is a way of ending that quarrel by making friends with ourselves. Then we may find that we are not as bad as we thought or had been told we were. If we label ourselves as hopeless cases or see ourselves as villains, there is no way to use our own experience as a stepping-stone. If we take the attitude that there is something wrong with us, we must constantly look outside ourselves for something better than we are. That search can continue indefinitely, on and on and on. In contrast to that approach, meditation is contacting our actual situation, the raw and rugged state of our mind and being. No matter what is there, we should look at it. It is similar to building a long-term friendship with someone. As part of the process of becoming friends, you get to know things that you do not like about someone, and you encounter parts of the relationship that are very uncomfortable. Acknowledging the problems and coming to terms with them is often the foundation for a long-term friendship. Having included those things from the beginning, you won’t be shocked by them later on. Since you know all the negative aspects, you don’t have to hide from that side of the relationship. Then you can cultivate the other side, the positive side, as well. That is also a very good way to start making friends with yourself. Otherwise, you might feel surprised and cheated later on, when you discover the things that you’ve been hiding from yourself. Whatever exists in us is a natural situation. It is another dimension of natural beauty. People sometimes go to great lengths to appreciate nature, by climbing mountains, going on safari to see giraffes and lions in Africa, or taking a cruise to Antarctica. It is much simpler and more immediate to appreciate the natural beauty of ourselves. This is actually far more beautiful than exotic flora and fauna, far more fantastic, painful, colorful, and delightful. Meditation is extremely down to earth, irritatingly down to earth. It can also be demanding. If you stick with it, you will understand things about yourself and others, and you will gain clarity. If you practice regularly and follow this discipline, your experiences won’t necessarily be dramatic, but you will have a sense of discovering yourself. Through the down-to-earth practice of meditation you can see the colors of your own existence. The earth begins to speak to you rather than heaven sending you messages, so to speak. We often approach life as though we were defending ourselves from an attack. Many of us, when we were growing up, were frequently reprimanded in ways that made us feel bad about ourselves. Whether the criticism came from our parents, a teacher at school, or someone else, it tended to reinforce a feeling that there was something wrong with us. Criticism often produced a feeling of isolation, a feeling of you and me, separated by a great divide. We learned many defense mechanisms at an early age, thinking that a good defense would be the best protection from further reproach. We have continued this approach as adults. Whether it’s a confrontation with a stranger on the street or an argument with our partner in the bedroom, we believe that we need good excuses to explain ourselves and good logic to defend ourselves. We behave almost as though we were professional negotiators, our own little lawyers. In Western psychology, some approaches stress the importance of reinforcing ego to enhance self-esteem. We may misinterpret this to mean that we should promote ourselves at the expense of others. A person may become very self-centered with this attitude. It is like you are saying to the world, “Don’t you know who I am? I am what I am. If I’m attacked for that, that’s too bad. I’m on the side of the right.” You feel justified in what you’re doing, as if you had God on your side, or at least law and order on your side. Perhaps we should reexamine these assumptions, to see what really works. We need to investigate whether it’s beneficial to build ourselves up, especially to do so by putting others down. We need to seriously question what is harmful and what is beneficial. In my own experience, I have found that employing a self-centered approach and being constantly on the defensive are not helpful. Rather than reinforcing our “me-ness” and justifying ourselves constantly, we should base our lives on something more powerful and trustworthy. 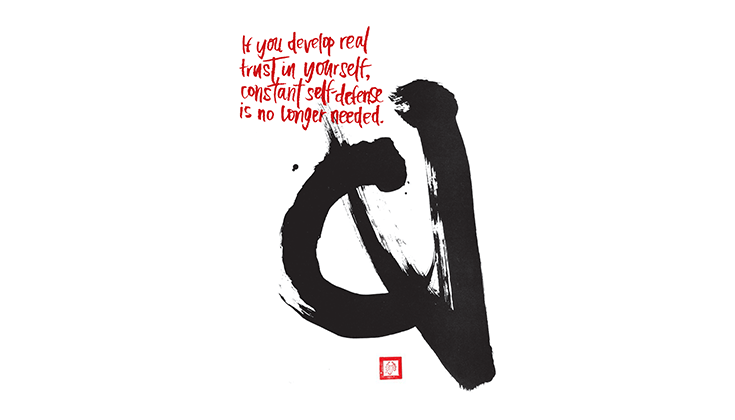 If we develop real trust in ourselves, constant self-defense is no longer required. That may sound good, but what are we going to trust in ourselves? To begin with, we need to look within ourselves. When we look, what do we see? Ask yourself: Is there something worthwhile and trustworthy in me? Of course there is! But it’s so simple that we tend to miss it or discount it. When we look into ourselves we tend to fixate on our neurosis, restlessness, and aggression. Or we might fixate on how wonderful, accomplished, and invulnerable we are, but those feelings are usually superficial, covering up our insecurities. Take a look. There is something else, something more than all that. We are willing: willing to wait, willing to smile, willing to be decent. We shouldn’t discount that potential, that powerful seed of gentleness. Even the most vicious animals possess natural affection and gentleness for their young. That element of gentleness exists in every being. We don’t have to be embarrassed about it or try to hide it. We don’t need to cast ourselves as bad boys and girls or as heroines or tough guys. We can afford to acknowledge and cultivate gentleness and, first of all, to treat ourselves better. It is worth appreciating ourselves, having affection for ourselves, and taking care of ourselves. Genuineness, goodness, and appreciation are extraordinary gifts. Ultimately, that is where we place our trust. This truth is so true that we don’t have to pretend at all. It is real. Every one of us is capable of loving ourselves. We are also capable of falling in love. We are capable of kissing our loved ones. We are capable of extending our arm to shake hands. We may offer a meal to someone, welcoming him or her to the table, saying, “Hello. How are you?” We are capable of these simple things. We’ve been performing such ordinary acts of kindness for a long time. Generally we don’t make a big deal about this capability, but in some sense we should. 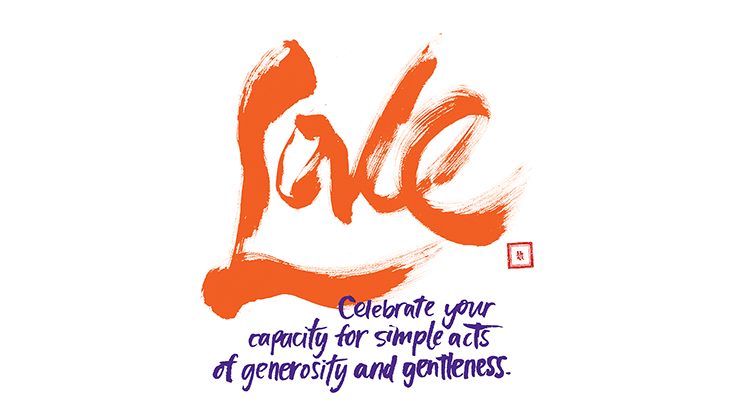 We should celebrate or at least acknowledge our capacity for simple acts of generosity and gentleness. They are the real thing, and in the end they are much more powerful and transformative than aggression, egomania, and hatred. When you appreciate yourself, you realize that you don’t have to feel wretched or condemned. You don’t have to artificially puff yourself up, either. You discover your basic dignity, which comes along with gentleness. You have always possessed this, but you may never have recognized it before. 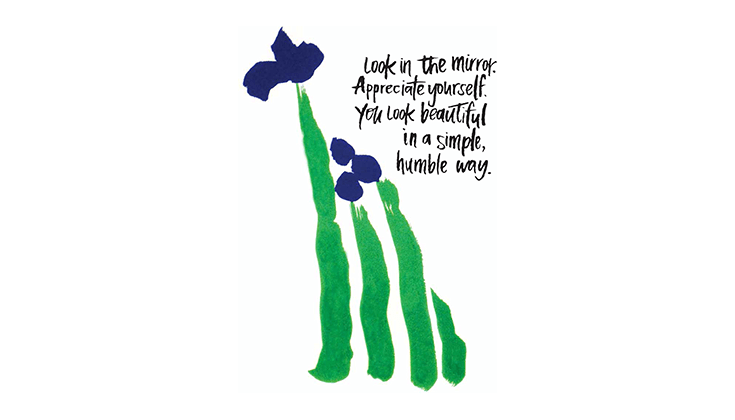 You don’t have to be an egomaniac to appreciate yourself. In fact, you appreciate yourself more when you are free of the ugliness of that egotism, which is actually based on self-hatred. Adapted from Mindfulness in Action: Making Friends with Yourself through Meditation and Everyday Awareness, by Chögyam Trungpa, with permission from Shambhala Publications. Paintings used by permission of Diana J. Mukpo.